Since we’re doing healthy burgers this week, I thought it would finally make sense to dust off these Bruxie pictures I’ve been holding on to for a while and show you a burger you should eat when you want to blow your diet. I don’t want to blather on, so here’s a summary: The guy who woke up one day and decided a burger should get it on with a waffle should be commemorated with a statue. Get to Bruxie and inhale this burger as soon as possible. For some background: Bruxie is a new walk-up waffle shop in Old Towne Orange, Ca. The place slings savory and sweet waffles and has a pretty great selection that includes a prosciutto and Gruyere waffle, wild mushroom and arugula waffle and a bacon, egg and cheddar waffle. They’re most known for the burger ($7), a thick slab of Angus beef smothered in cheddar and dressed with mayo, tomato, pickle and lettuce. 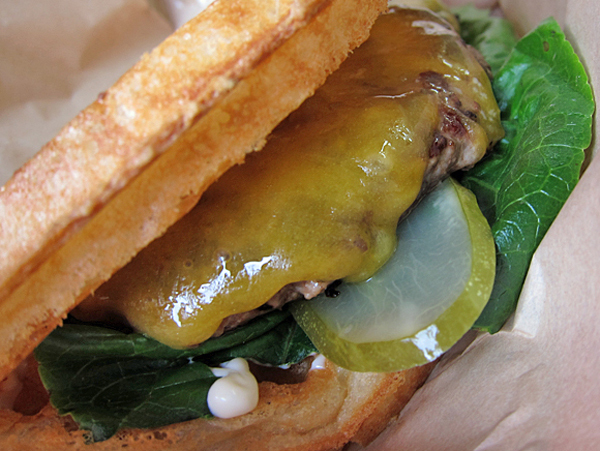 The pairing of the juicy beef with the buttery, crispy waffle is unlike any burger experience I’ve ever had, but one I crave over and over again. 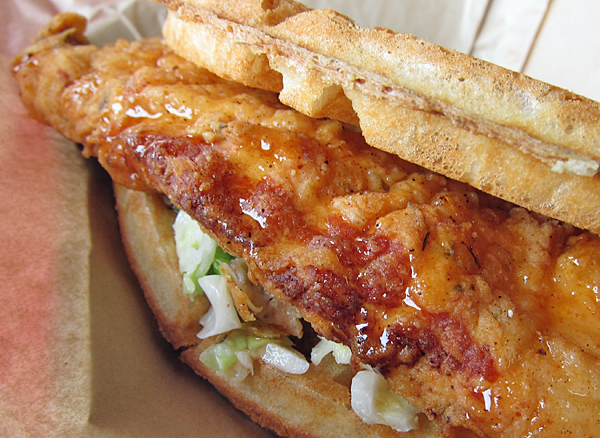 They also sell a buttermilk fried chicken and waffle sandwich ($7) that’s pretty much the best thing to happen to fried chicken since EVER. It’s a perfect sandwich for those who wish their Southern meal were conveniently mobile. The chicken is thin enough that it doesn’t hinder the eater from taking clean bites, plus the flavor of spiced-up honey and crisp slaw provide great balance to the sweet meat. No burger or chicken sandwich should be without fries or a drink, and Bruxie does both of those just as well. 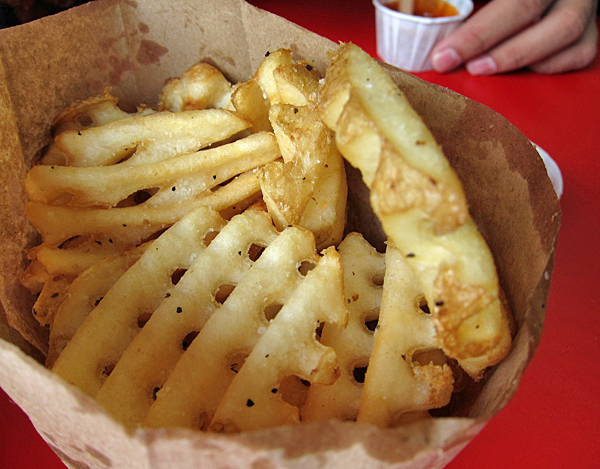 Of course they sell waffle fries ($3) — delicious, crunchy waffle fries that beat the pants off the frozen spuds they fry-o-late at Carl’s Jr.
Bruxie also sells its own old-fashioned soda ($2), made with real sugar instead of that villainous high-fructose corn syrup crap. 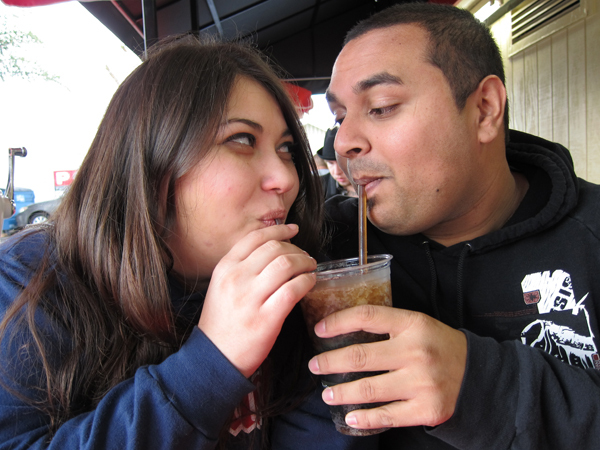 Find yourself a pretty lady (or burly dude, whatever) and share a sip between bites of a sandwich and fries. 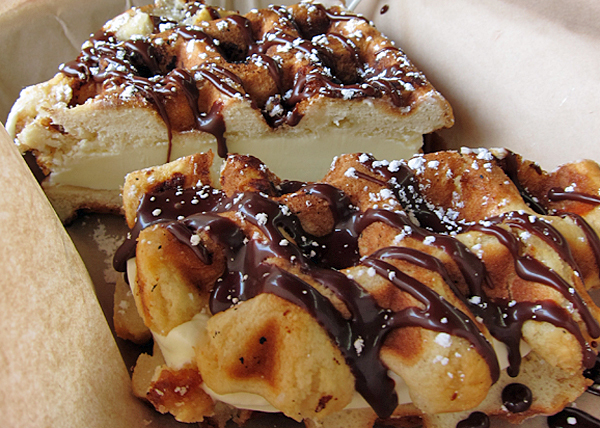 And you can’t have soda-pop without washing it down with a waffle ice cream sandwich, right?! This one ($?) is so super cold that we ate all of our meal and it was still rock solid! At Bruxie, they’re celebrating the waffle better than anyone in Orange County. And, if you’re tired of waffles by this point, or even if you’re not, might I suggest the frozen custard?